The exhibition Jewelled Tales of Libya, curated by Najlaa El-Ageli and Hala Ghellali, will take place at the Arab British Centre from 19 to 27 January 2017. Jewelled Tales of Libya is a rare exhibition which will explore the diversity and historical identity of a country through its tradition of fine jewellery. By showcasing this rich cultural heritage, the exhibition aims to tell the stories behind the adornments and symbols that feature heavily throughout the geographical expanse that we know as Libya. 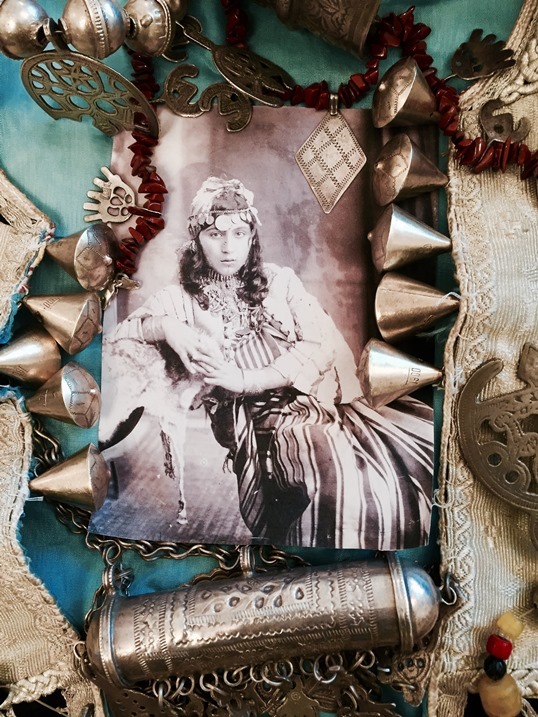 Alongside a display of 45 pieces of authentic Libyan silver jewellery from the 1920s to 1960s (comprising chokers, belts, headpieces, bangles, silver slippers amongst many other pieces), the exhibition will show 13 original vintage photographs, that belong to the curators’ private collections. Dating back to the early decades of the 20th Century, the images of Libyan women were taken by the Italian cameramen, (such as Aula, Nascia, Rimoldi and others),who established studios in Libya during the European colonisation and who contributed to the Orientalist strand of photography. In contrast to this old collection, the exhibition will also feature more recent photographs taken by the talented Libyan photographer Sassi Harib, whose work captures the essence of Libya’s Southern women adorned in their jewellery. Furthermore, Hala Ghellali, one of the curators, will be giving a talk about Libyan jewellery, its symbolism and the history of silver making in Libya on 24 Jan, 6:30pm – 7:30pm @ The Arab British Centre (admission is free).